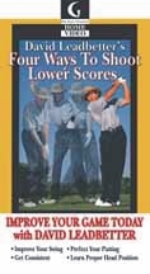 World-renowned golf instructor, David Leadbetter, simplifies the four fundamentals crucial to a successful golf game in Four Ways to Shoot Lower Scores. Discover how to improve your swing, perfect your putting, get consistent, and learn proper head position. Through the help of some of his star students like the PGA Tour's youngest rookie in history, Ty Tryon, rising star Charles Howell III, and the Wonglukiet twins, Leadbetter shares his expert advice. David Leadbetter will help you build a more consistent golf swing and lower your scores for years to come.